Fresh strawberries are such a treat and with Wimbledon around the corner what could be better than a bowl of fat juicy strawberries picked fresh outside your back door accompanied by a glass of Elderflower champagne! I grow mainly summer fruiting varieties of strawberries like Jubilee and Mara des Bois in the fruit garden but this year I’m growing a few fruit and veg outside the back door mainly for convenience, but also to show you don’t necessarily need a large garden to grow great tasting fresh produce. 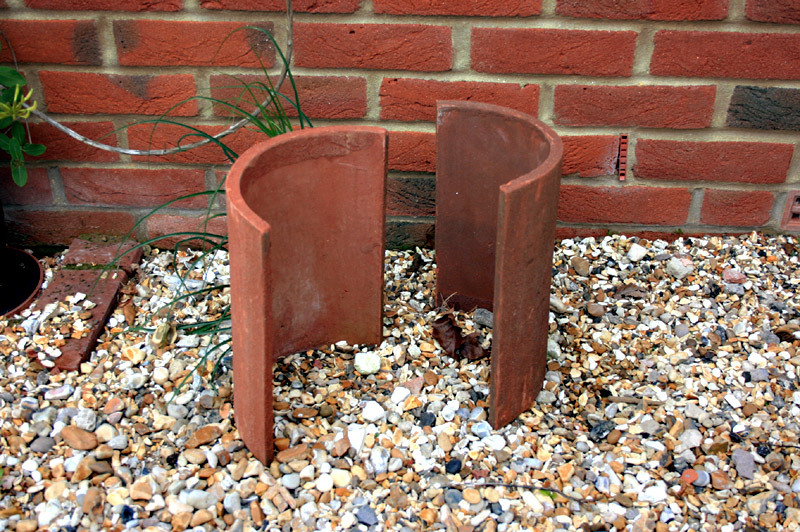 I’m always looking to recycle items wherever possible and I was looking around the garden and came across a few ridge tiles left over from the build. I thought if I stand them on end and find some way of fixing them together they might make cheap and cheerful strawberry planters. They’re nice and tall, which will keep soil born pests off the fruits, and the extra depth will provide plenty of space for the plants to root into. 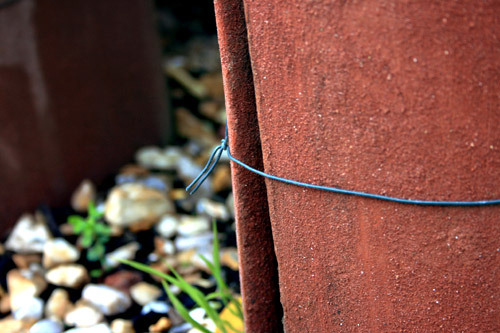 They’re quite heavy but once positioned in the gravel they are easily pulled together using garden wire and a pair of pliers. I’m really pleased with the results and the terracotta gives them a lovely natural feel and the gravel sets them off nicely! 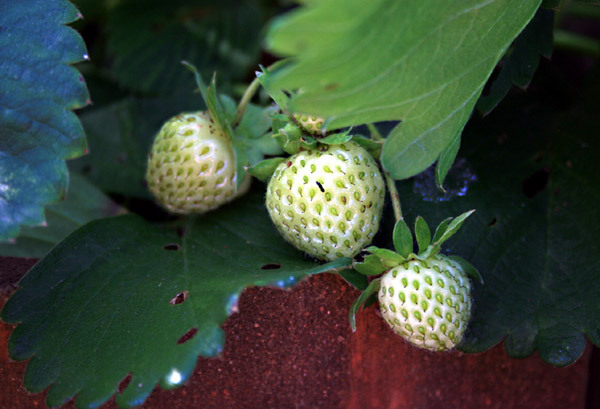 Strawberry plants really need full sun if they are to thrive, but will grow just fine in partial sun. I’ve positioned my planters on the edge of the patio which is full sun for most of the day, at least until the sun goes behind the trees. I use 50 parts well rotted garden compost and leaf mould, mixed with 50 parts sifted top soil. You can use a mix of John Innes and Ericaceous compost but we’re about building a garden on a budget so I prefer to use what we have available at our disposal if at all possible. Feed or not to feed? As a general rule when it comes to feeding plants stick to Potash for fruit and flowers and Nitrogen for green leaves and growth. 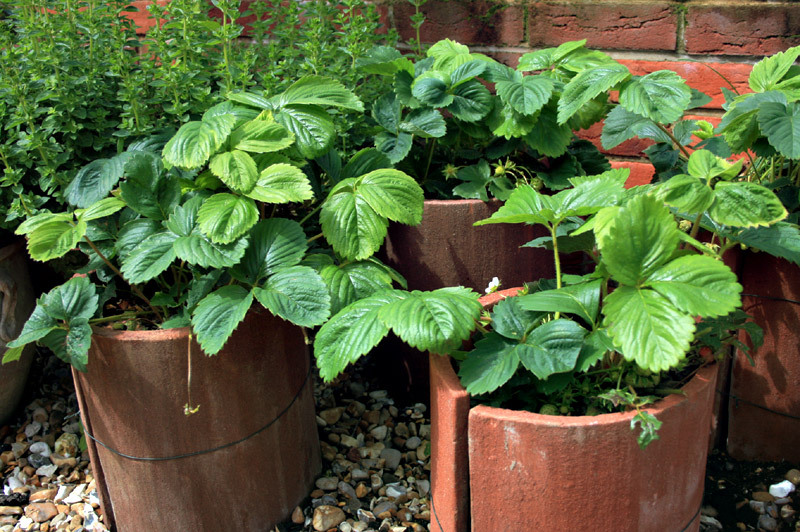 If you want fat juicy fruits and you’re growing your strawberries in pots I’d recommend feeding during the fruiting season. I start adding potash rich feed to my watering just as soon as the fruits have set. I tend not to feed when they’re not in fruit as it only produces more leaf growth. Yes it can but you can use natural occurring potash in the form of wood ash which is free (if you have a wood burner that is) alternatively shop bought tomato feed works really well. For a taste of the countryside and as a perfect accompaniment to a bowl of fresh strawberries and cream why not have a go at making you own home made Elderflower champagne. It’s the perfect time of year, the flowers are everywhere, and if you wait for a sunny day it’s the perfect time to grab a basket and have a go at a little light foraging! If you fancy having a go at making your own strawberry planters you might want to try your local reclamation yard or builders merchants. They usually have a few ridge tiles lying around or something similar and someone you know is bound to have a couple of strawberry plants to get you started. So have some fun making your own planters, the more unusual the better! 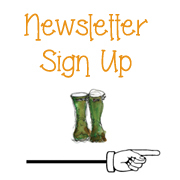 Please be assured we will not share your email address with anyone and will only send you lots of useful gardening tips and information from time to time.